The Royal Danish Mint has released (3rd December) a new collector Brilliant Uncirculated mint set which also remembers the 200th anniversary of the founding of the country’s central bank. 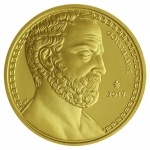 The anniversary is this year’s mint set theme which describes the 200-year history of the coins. 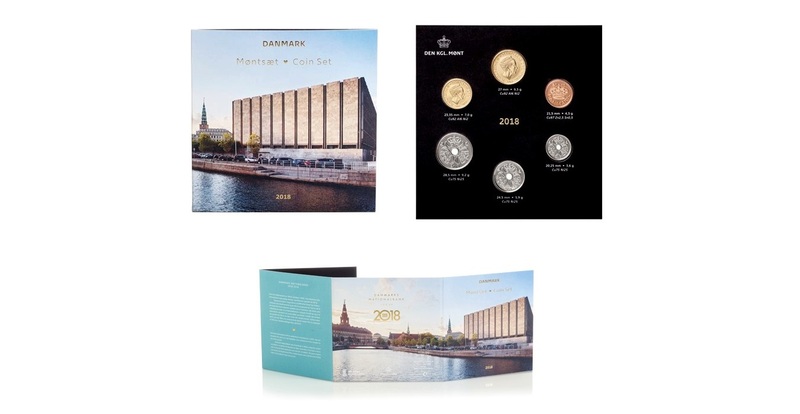 The coins are presented in an exclusive booklet with Danmarks Nationalbank’s special anniversary design. The Nationalbanken was established on the 1st August 1818, by royal proclamation of King Frederick VI of Denmark. One of the primary functions of the private bank was to issue currency in the form of banknotes and was given a 90-year monopoly to do just this. The function was renewed in 1907, a year before its expiry for another 30-year extension until 1938. In 1914, the National Bank itself became the sole banker for the Danish government, which became fully independent of the government in 1936. The bank’s first location was on the Slotsholmen, which was next to Copenhagen’s Børsen, or stock exchange. A new location was found in 1866 at Holmens Kanal and the bank commissioned the famed Scandinavian architect Johan Daniel Herholdt to design new offices, which were completed by 1870. The National Bank oversaw the introduction of a silver Riksdaler coin as part of a monetary reform that was issued under their authority in 1845. This reform was followed by the implementation of the kroner, which saw the introduction of a new currency that was part of an overall Scandinavian Monetary Union introduced in 1875. It is this kroner currency issued 143 years ago that continues today, although Denmark is part of the EU, it is not part of the single currency. Today, the bank occupies one of the city’s most recognisable landmarks, when in 1965 construction began on the building, which was designed by internationally renowned Danish architect Arne Jacobsen (1902–1971). Located on Havnegad, this canal-adjacent location is in Copenhagen’s Gammelholm district, close to the Old Stock Exchange, the Holmens Church, and Christiansborg Castle. The modern-concept design featuring defined angles and stylised texture was completed in more than one stage, which was finalised by 1978, and carried on to Jacobsen’s specifications after his death by close associates. A display of all banknotes and coins issued by the Danmarks Nationalbank since 1818 was added to the lobby of the bank and is open to all visitors. The 2018 year set includes the six currently circulating coins from 20-kroner to one-krone, and the 50-ore copper coin. The folder includes images of the current bank’s location and the commemorative logo of the bank’s bicentenary anniversary. For additional information about these coins and others available from the Danish Royal Mint, please visit their website.